The dark money nonprofit launched by Hillary Clinton following her defeat against Donald Trump relied heavily on just six donors and an $800,000 money transfer from her former presidential campaign committee during its first year, according to tax forms provided to the Washington Free Beacon. Clinton's nonprofit, the New York-based Onward Together, was incorporated on April 24, 2017, by Marc Elias, a prominent Democratic lawyer and partner at the Washington, D.C.-based Perkins Coie law firm, filings show. Elias served as Clinton's top campaign lawyer. 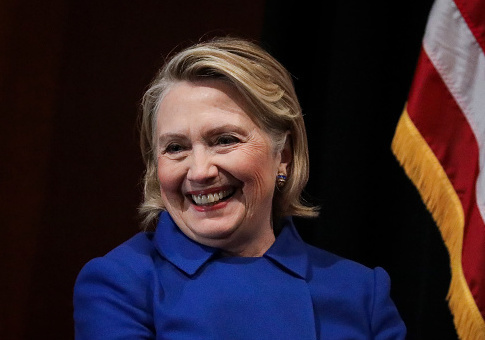 Clinton launched Onward Together to allow her to be a part of the resistance against Trump and to encourage "people to organize, get involved, and run for office." The group would additionally send money to already established liberal groups who could provide direct action against Trump and Republicans. The Free Beacon first attempted to obtain Onward Together's 2017 tax forms over a month ago but did not receive a response at the time. However, a search of state filings in North Carolina showed that the group had taken in just $3.1 million in contributions during its inaugural year. Nick Merrill, Clinton's spokesperson, recently provided the group's tax forms. The tax forms show that six donors and a money transfer from her former campaign committee accounted for $1.3 million of the $3.1 million of the funds the nonprofit hauled in throughout its first year, more than 40 percent of its total haul. Onward Together, which is a 501(c)(4) "social welfare" group that is not required to disclose its donors, reports contributions from seven unnamed individuals in the amounts of $800,000, $500,000, $11,419, $7,266, $7,000, $5,710, and $5,190. The remaining $1.8 million came from individuals who provided $5,000 or less. While the donors are not listed on the tax forms, the Free Beacon previously found that Clinton had made a $800,000 transfer from Hillary for America, her campaign committee, to Onward Together days after the group was incorporated. That transfer alone accounted for 25 percent of the group's total funds. Merrill called it a "distortion" that Clinton's group received more than 40 percent of its funds from the six donors and the presidential campaign committee and added that it has "been an effort fueled by individual donors giving $35 at a time on average to help fund some of the most impressive political organizations in America, all of which helped usher in a wave of Democratic wins across the country last November." Onward together provides financial support to a number of organizations who are involved in the resistance and handed out $1.1 million in contributions to left-wing organizations throughout its first year. The donations ranged between $30,000 and $100,000 and went to the Color of Change PAC, Emerge America, Emily's List, Swing Left, Run for Something, National Redistricting Foundation, Latino Victory Project, IVote, Alliance for Youth Action, the Arena, Collective Future, Ultraviolet, and Voto Latino. Minyon Moore, Onward Together's president who is a principal at the D.C.-based Dewey Square Group, did not collect a salary from the group. Charles Baker, the director and treasurer of Onward Together who is the president and founder of the Dewey Square Group, also did not collect a salary. Dennis Cheng, Onward Together's finance director who previously was the chief development officer at the Clinton Foundation from 2011 to 2015 and the national finance chair for Clinton's 2016 campaign, was paid a $60,000 salary for 30 hours of work per week. Kelly Mehlenbacher, the group's chief operating officer, was paid $35,000 for 20 hours of work per week while Huma Abedin, the longtime Clinton aide who is listed as an officer of the group, collected $45,000 for a reported 15 hours of work per week. This entry was posted in Politics and tagged Democratic Donors, Hillary Clinton. Bookmark the permalink.